May 8 Good grief! 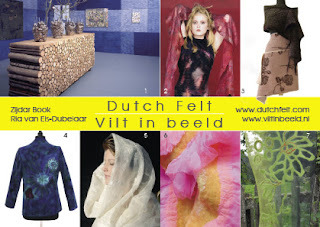 *textile content* !! Here in Ghent, we've enjoyed our independence and freedom from the constraints of being with a large group. Today, we've pottered around the city, taking time to stroll around and do things at our own pace. That sometimes means doing things more slowly but more often, it means skipping over some bits but luxuriating in the joy of just stopping and standing a while, taking in the atmosphere! We stumbled upon a small shop with this intriguing window display of merino fleece and of course, I simply had to go inside to take a closer look. In amongst the wonderful collection of art materials was a large book section, and there on top of the pile of inspection copies was a copy of Dutch Felt , such an inspiring and attractive book, it just had to be brought home with me. I've now had the chance to sit and look more closely at it and find it a most intriguing book. It's written in both English and Dutch and cleverly designed so that each language gets priority and yet as a reader, I don't feel cheated because I have access to only one half! Photography standards and production values are high and there is a good section on "how to" at the back. The first section of the book focuses on the author, Ria van Els-Dubelaar, followed by a good few pages profiling some of her colleagues and friends. In other words, I think the book achieves something that many titles don't - provide inspiration, background information, "recipes" and details of how to get some of the effects, all presented in an attractive and easily read format. Bravo! 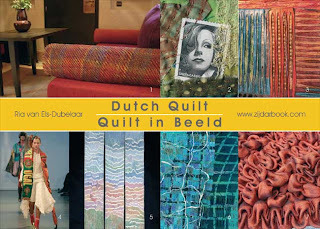 As I opened the book for the first time, a card slipped out with details of another title: "Dutch Quilt". Hmmmm.......further investigation needed! May 9 Over the border! May 8 "..and how would you like your asparagus, Madam?"